Cutting the tree at the base and causing it to fall in a controlled manner. Taking a tree down in sections. To reduce the height of the crown, by removing the uppermost branches (maximum reduction of the crown is 30- 50% or the tree may not survive). Removing branches to allow light and wind to pass through the crown of the tree. Selective removal of branches to enhance the shape. Cutting a large branch right back to the trunk. Either removing the whole tree or removing torn and dead branches from the crown. Reducing the height and thinning fruit trees to make the fruit more accessible and to allow more light onto the fruit to aid ripening. Shrubs are pruned to reduce their size and to promote healthy growth and flowering. Cut Elm has to be burnt at a controlled site to stop the spread of the destructive Dutch Elm Disease. The removal of all side and top branches leaving just the main trunk. 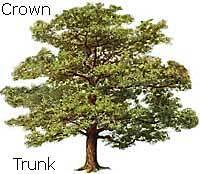 The trunk will then resprout. Used when the tree has got too big for the allowable space. Not advisable on Beech, Birch or Cherry.